I can always count on Nintendo-developed brain games to eat up a lot more time than I expect to invest in them. The latest Pushmo title, Pushmo World, developed by Intelligent Systems is no exception, giving me plenty to scratch my head and tear my hair out over. This clever puzzler gives 3DS fans a chance to move on to a much bigger screen (or only slightly larger if you're playing with the Gamepad screen), and gives series newbies a chance to see what makes these games so much fun on the 3DS. Even without the 'gimmick' of 3D, I found that this game makes a rather seamless transition from the portable to console. 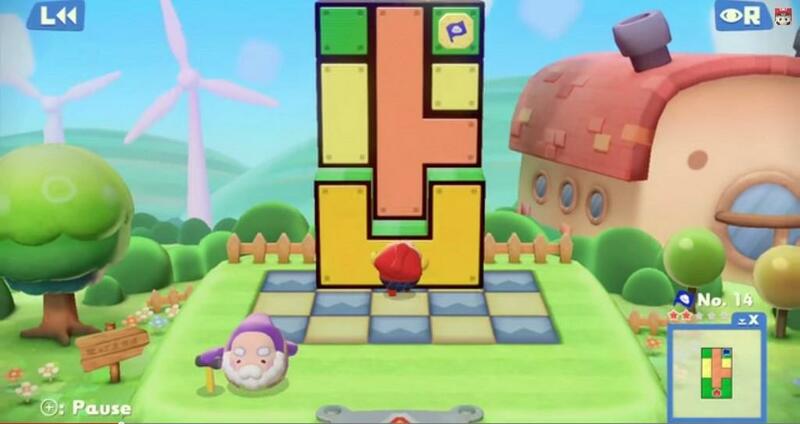 Mallo returns to save the children that have been trapped in Pushmo Park, with Papa Blox giving you tips, its up to you to save all the kids from their flattened fate. Of course it's not a deep story, but it's a cute premise. But we're here for the puzzles, and this game is sure to deliver. Pushmo Worlds gives you over one hundred and fifty different puzzles to solve, along with fifty training stages to help you get the hang of the mechanics of Pushmo. This isn't a game you can conquer in a weekend, which at first I was thinking it would be, and then I ran in to the brick wall that is Challenge S-2. I've been holding fast at that stage for a few days now, and simply can't wrap my head around it. So instead I decided to tackle the Mysterious Pushmo stages. This is where different elements get introduced that really shake up the game. While the main game never really strays beyond the manholes that let you warp between two points, the Mysterious Pushmo is where things get really hectic. Linked blocks will pull out all blocks of the same color, yin-yang blocks will pull out blocks of opposite color when pushed in and vice versa, and timed blocks will retract after a certain amount of time has passed. These Mysterious Pushmo make up a good chunk of the challenge, and provide a nice alternative when you need to take a break from the main game. If you're feeling creative, you can make your own Pushmo stages in the Pushmo Studio, or download stages via QR Codes. As you progress through the main scenario, you'll be able to unlock more features that you can put in to your own Pushmo creations. If you're a fan of pixel art or perler beads, this is your chance to make some challenges out of the characters of games long past. Nintendo and Intelligent Systems already did a few murals just to show what the game is capable of, and they are some of the most challenging in the game. You can pick up the creations of other players via the World Pushmo Fair, though at the time of this review, that exchange was not functional due to server errors. Pushmo Worlds isn't a particularly hard game, yet it's actually full of 'Eureka!' moments, but on the flip side of that there are times where it's better to just reset the map and start over, because what you've been doing up to that point hasn't been working. And sometimes the simplest way to solve a puzzle is to go backwards. If you've played Catherine on the PS3 or 360, then you're likely to be familiar with some of these scenarios, although without the threat of imminent death if you screw up. 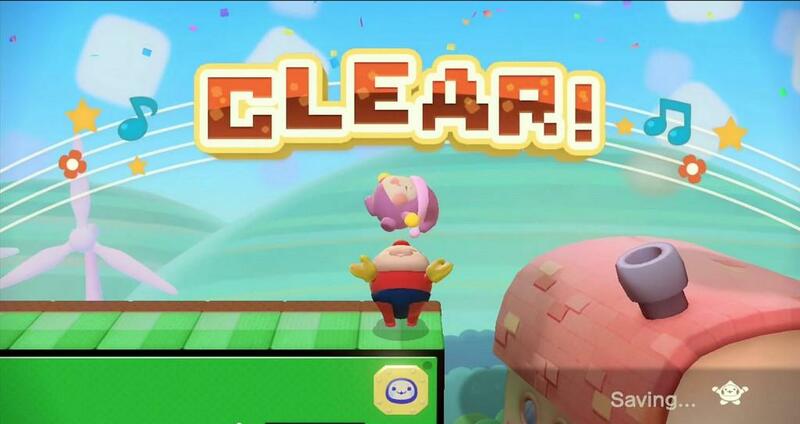 Pushmo Worlds doesn't really have any sort of punishment for failing to complete a level, in fact if one's got you stumped you can skip it and come back later, although that means you'll be passing up a Miiverse stamp for that selection of levels. But it's really cool to see that Intelligent Systems doesn't want their game gated just because you have difficulty with one puzzle. 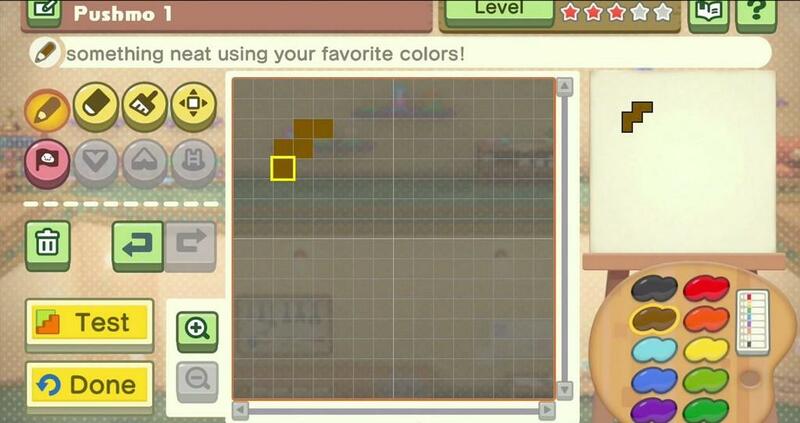 Pushmo is more about the content than the visuals, which is to be expected from a downloadable title. Intelligent Systems seemed to simply port the 3DS visuals to the WiiU, it doesn't make them bad, but it's just simplistic. Same could be said for the music and audio, there isn't a whole lot of superfluous noise, just something to keep you moving from one stage to the next, and if you find a particular track boring, you can go and swap it out from the options. Pushmo Worlds is a perfect 'break game,' when you've burned yourself out on too much Mario Kart, or Super Mario 3D World, and just want something you can really relax with. It offers a moderate challenge that gives you a great sense of accomplishment when you finally figure out some of the tougher puzzles, and is just a load of fun. Can't really say anything bad about this one, if you've played the previous Pushmo games, no reason to miss this one. 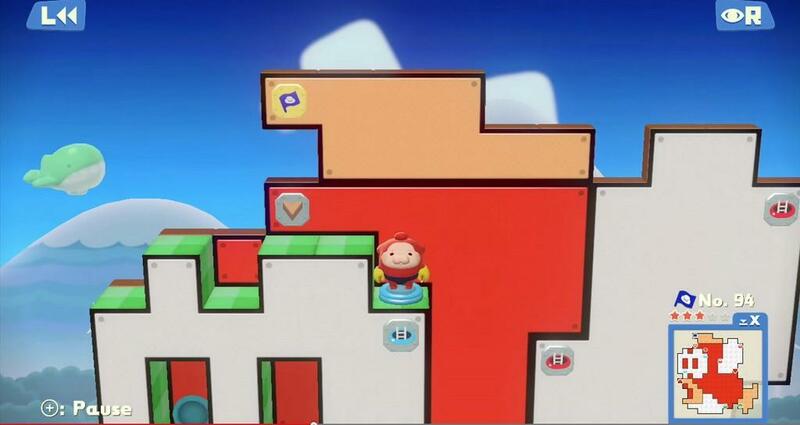 Pushmo Worlds makes a solid if subtle landing on the WiiU platform, and offers a ton of fun in a small little package.